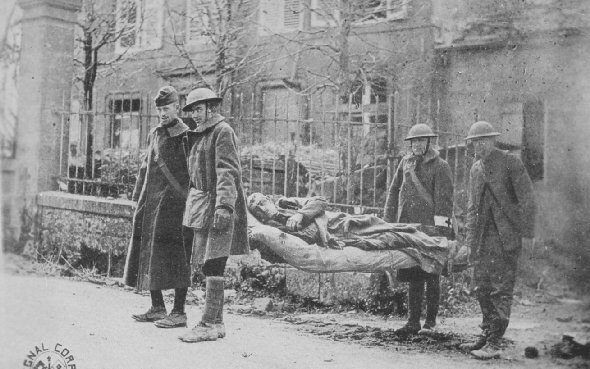 Stretcher bearers, 317th Inf., 79th Div., taking last German prisoner out of the house used as observatory by Crown Prince, from which he directed the attack on Verdun early in the war. Montfaucon, Oct. 2, 1918. Remains of tile fire place, only masonry left standing in what had been No Man's Land since 1916. This photo was made in a fog of gas that was so thick that visibility was good only up to 200 meters. The 79th Div. 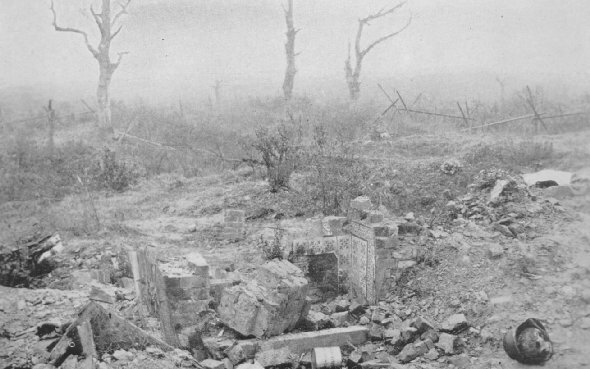 advanced upon this point over rolling ground pockmarked with waterfilled shell craters, and through a tangle of barbed wire and cheveux-de-frise, into the face of the machine-guns left behind by the Germans to cover their hasty retreat. Haucourt, near Malancourt.